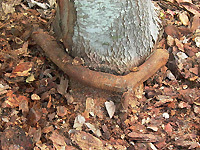 Mulch can be applied around the root ball to control weeds and conserve soil moisture. A thin layer of about one inch can be applied to the root ball surface for decorative purposes (top left). 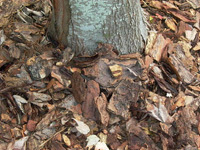 Excess mulch on the root ball surface (top right) can repell water, retain water meant for the root ball, harbor rodents which can damage to the trunk, and encourage formation of stem girdling roots (bottom left and right). Copyright © 2011-2016 Urban Tree Foundation All rights reserved.